It is a pretty awesome day when I get to be a guest contributor over on a site that helped inspire me to start my own blog! Makes & Takes is one of the first blogs I started following regularly about two and half years ago. I had recently moved to a new town and was stuck indoors during rainy season with a tantrumy toddler. The Winter 2010 Olympics were on TV and Marie had loads of crafty and creative ideas that inspired me to stop being depressed and sad about our move and start having fun with my little guy. I love her site for craft projects, recipes, and other fun things. 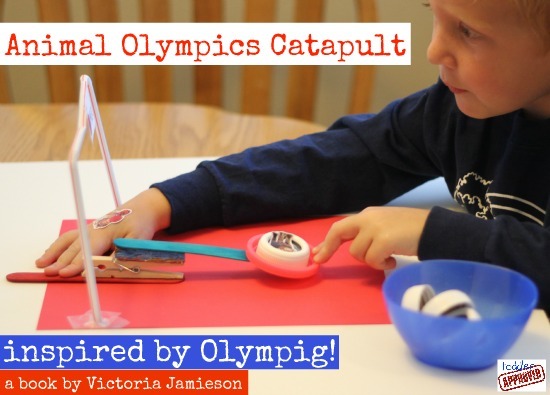 Today I am sharing an Animal Olympics catapult activity over at Make & Takes that was inspired by the book Olympig! by Victoria Jamieson. I would love for you to hop on over and check it out if you have a moment. If you have a favorite Olympic post or children's book, go and share that in the comments over there too. I am always looking for new ideas. Thank you! You can find the Animal Olympics Catapult tutorial here! PS- Don't miss our BabbaBox giveaway! You can find out all of the details here. The giveaway ends on Tuesday, August 7th... so don't miss out!